In Homogeneous South Korea, A Multicultural Village Hints At Change : Parallels "Wongok Village is what Korea will look like in the future," says a grade school teacher in a self-styled "borderless village" south of Seoul, where most of the residents are non-Korean. 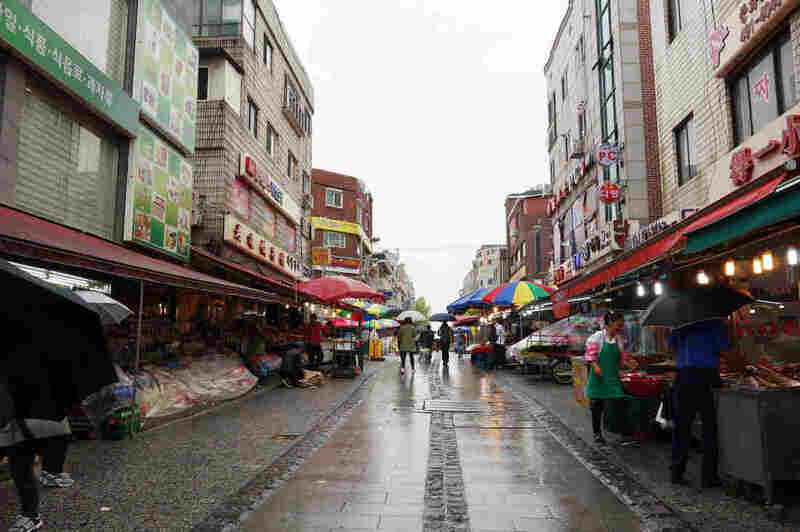 "Multicultural Street" in Wongok Village features stores, restaurants and stalls that serve the international community. Populations are shrinking so fast in East Asia that some Japanese and Koreans actually talk about the eventual extinction of their civilizations. To tackle demographic declines driven by low birthrates, the historically homogeneous South Korea is opening itself to more immigrants than ever before. It's happening most notably in a place called Wongok Village outside the city of Ansan, an hour's drive south of Seoul. At Ansan West Elementary School, the students represent dozens of countries — China, Vietnam, Sri Lanka and several more. Most of them have managed to pick up the Korean language quickly, but for those who don't, the school is one of few public schools in the country to offer remedial Korean classes. The elementary school is in the heart of Wongok, which is billed as a "borderless village" in which two-thirds of the 17,000 residents are non-Korean. Industrial work requiring cheaper migrant labor and Ansan city's efforts to provide services for non-Koreans led to a fourfold jump in Wongok's immigrant population from 2002 to 2010. 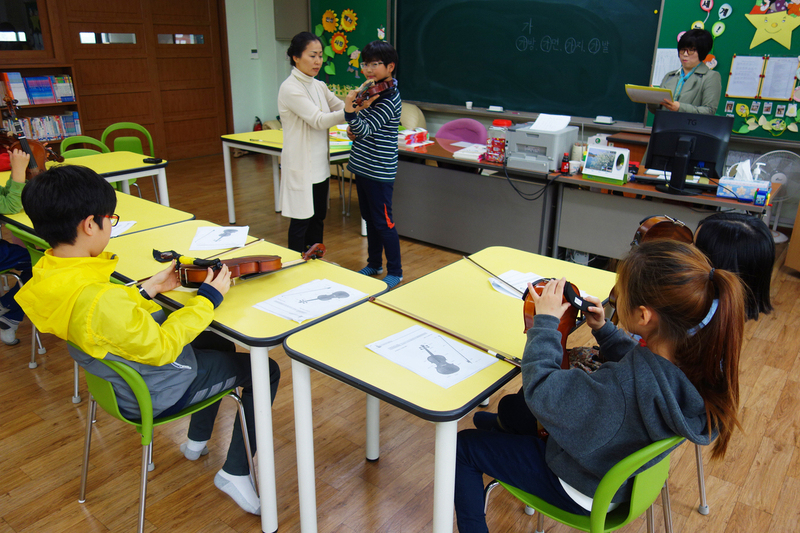 A violin lesson at Ansan West Elementary School, where students come from so many different countries that the school has a "multicultural coordinator" and language support for non-native Korean speakers. Most of the immigrants are from China, living here as residents on work visas. But under Korea's latest immigration policies, migrants who seek citizenship are allowed to hold dual citizenship. "[In] places with multicultural kids, the kids can interact with each another and get into conflicts with one another and break prejudices," says Kim Young-sook, a teacher and multicultural coordinator at the school. She plays an increasingly vital role here, as Wongok — unique in its concentration of non-Koreans — offers a lesson in fast adaptation to immigrant communities. "There is real immigration going on that is supported, facilitated, advocated by the South Korean government," says Katharine Moon, the SK Korea Chair at the Brookings Institution. Her research focuses on the impact of a changing Korean population. Immigration is a fairly new concept in South Korea, where foreigners make up only about 3 percent of the population. Bars and restaurants can ban non-Koreans from entry because no anti-discrimination laws exist. Foreign workers in Korea are subjected to mandatory HIV testing. "It has been a homogeneous society linguistically, culturally, for so long. It has prided itself on the purity of the bloodline, the so-called bloodline," Moon says. But because the birthrate has fallen to such low levels — South Korea has the lowest fertility rate among developed nations — immigration policies are changing. Government figures show the number of foreign residents living in South Korea climbed by about 50 percent between 2009 and 2014. Moon says attitudes will take a little longer to adjust. "Right now, [integration] is about fitting into the Korean context, learning Korean language and not teaching your kids Vietnamese or Tagalog or some other foreign language," Moon says. "True multiculturalism would involve mixing and blending and fusing of different languages, cultures, customs. We don't see much of that — except in places like Wongok Village." 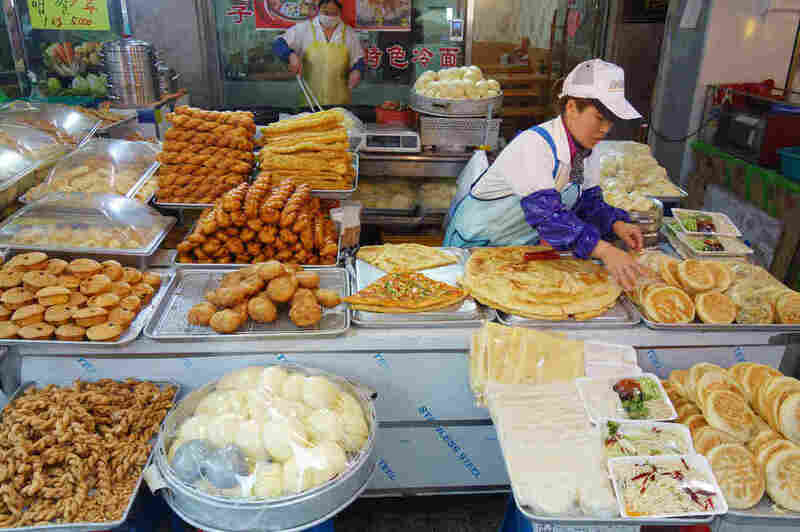 A food stall in South Korea's Wongok Village sells Chinese flatbreads and other snacks popular in China. Two-thirds of Wongok's residents are not ethnically Korean, and many of them are from China. Outside, on what's known as "Multicultural Street," people from different backgrounds mix. In front of the banks, there are signs in four or five different languages. Food stalls sell a lot of Chinese food, and there are Chinese markets and Chinese karaoke joints. You can hear Vietnamese as you walk up and down the streets. "[There are] job opportunities here because there's a lot of factories. And you know, in every place where there's electricity, there's work opportunity," says Eugene Okoye, who came to Wongok four years ago from Nigeria to run a clothing export business. As more people like Okoye seek opportunities in Wongok, their kids fill the classrooms of teachers like Kim. She says the children have taught her about dropping prejudices. "Multicultural people are people that Koreans have to work together with to make Korea into a better country," she says. "Wongok Village is what Korea will look like in the future." The kids offer a key lesson, she says: They relate to one another as peers — not as different peoples.